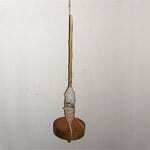 Spindle produces a fine-grained, easily split wood. It is not particularly durable, but has been used to make spindles (hence the common name), knitting needles, skewers and toothpicks. It is also very good for carving. The charcoal produced from spindle wood is of very high quality and is used by artists. 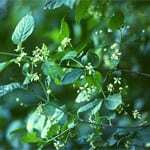 Spindle’s leaves appear at the same time as the flowers in May and June. They are elliptical with fine teeth on their edges. 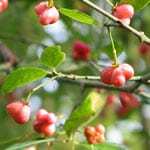 In the autumn, spindle can be readily identified by its intense red colouration. 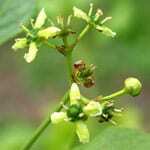 At the base of the tiny inconspicuous flowers is a ring-shaped bulge. On this bulge is a morsel of nectar that attracts insects to help with pollination. The flowers appear in May and June. Spindle fruits are perhaps the most unusual of all our native trees and shrubs. They consist of green ‘capsules’ that become become bright pink when they are ripe in September and October. Each capsule has 4 compartments. In each compartment is a whiteish seed with in a orange ‘cover’. 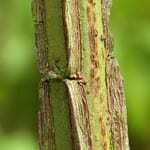 The young bark is smooth and greenish. When the tree ages a little the bark becomes grey with vertical stripes. In cross-section, a typical young branch of spindle is square. At each corner of this square is a ‘corky’ growth. 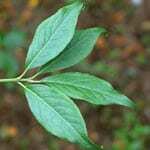 Spindle grows in either dry or moist soil which is usually rich in lime. It grows on the edges of woodlands and in hedges.